Regular blogging here since the beginning of 2008 has proven to be an elusive goal. By saying even that, I am probably engaging in what could properly be considered a textbook definition of the word "understatement". "DANG straight," some may now be exclaiming, "you've practically been AWOL for four months -- you usually create more posts in a single month than all of 2008 -- and inquiring minds want to know: what's the deal with that?" 2. Our YWAM base has been going through some... interesting changes, so we've been chilling in the aftermath. As further proof of God's sense of humour and comedic timing, things at our base were brought into the light on the day before Post-Charismatic? was published in the U.K., and our decision-point about our future in YWAM came the day after the book's release. For perspective, it's important to know that YWAM is a very large and very doctrinally diverse organization. While there are commonly held values for every base in YWAM, there is also a great deal of latitude when it comes to doctrinal emphases and practices. And each YWAM base has a great deal of autonomy and freedom to develop in its own way, depending on the leadership team, and ultimately the base directors. To make a long story short, the YWAM base that Wendy and I have been at for the past couple of years has chosen to emphasize the teachings of a local Dominionist church (link provided for the morbidly curious), which includes a heavy dose of hyper-Prosperity (Health & Wealth) teachings, and also the authoritarianism of "never question your leaders" (especially if they insist on being addressed as "Apostle"). And everyone on staff at our YWAM base was expected to submit to the Apostle and his teachings as part of the (exciting! anointed! miraculous!) "new direction" for the base. In short, pretty much everything that I wrote against in my book. Hence the recognition of God's comedic sense of timing as all this was brought into the light. Wendy and I are doing just fine! For us, the "bringing it into the light" represented an answer to prayer in a big way. We had sensed something was afoot after returning from Mexico, and had been praying that God would make things really obvious so that we could see where things were going, and make decisions accordingly. Leaving a specific YWAM base is NOT synonymous with leaving YWAM. No, we don't know what God has for us next... yet. Yes, we have every confidence that if He could so clearly answer our prayers as to revealing what was brewing at our (now former) YWAM base, He will also be clear in leading us into what's next, and where, and when, and how. "Why?" might not be one of those questions that we get an answer to, but we're okay with that. Sometimes, that's what "trust" looks like. 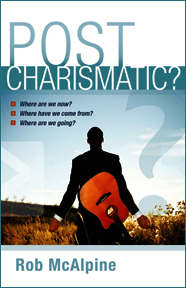 This coming Monday, I should have a small box with copies of Post-Charismatic? showing up on my doorstep. After all this time of editing and proofing, it seems very surreal to think "over in the United Kingdom, in faith I believe that a book I wrote has been published". What makes it surreal is that I haven't actually held a copy in my own hands, nor is it released in North America, although the day for both is approaching quickly as well. So, while I mentally understand that Post-Charismatic has been officially released, the geography involved makes it almost seem unreal. Finding an online bookstore in the U.K. that carries the book helped with that strange sense of unreality. As soon as it's available in North America (Amazon, etc. ), I'll be sure to let y'all know! 'Charismatic' is a loaded word. For some it's old-hat, for others it's unknown, and for still others it's dangerous. But for a growing number, it's a bad dream they want to forget. Rob McAlpine writes for all these, but especially for the last category – those who embraced charismatic renewal with hope and excitement, only to be found picking themselves up off the floor after years of disappointment, disillusionment and even spiritual abuse. Rob deals with facts before venturing an opinion. Carefully he steers us through the relevant history, looking in depth at the 'Latter Rain' movement, teaching on 'shepherding', and the prosperity 'gospel' that ultimately brought pain and disillusionment to so many. Then, aware that it's often easier to criticize than to construct, he explores possible ways forward to a more mature expression of spirituality and a shared life together as disciples of Christ today. "Rob McAlpine writes with a positive and constructive voice. He shows us that the answer to misuse or excess concerning the Holy Spirit is not 'no use' but right use. For burned-out and hurt former charismatics, Post-Charismatic? leads the way forward toward a mature and sane re-engagement with the person and work of the Holy Spirit. Post-charismatic is not post-Holy Spirit, it is a call for post-weirdness." These next few months should be interesting! Brother Maynard and his incredible family, along with the Clan McAlpine, will be joining forces once again, neither in Winnipeg nor Kelowna, but (insert drum roll here) -- Medicine Hat, Alberta! Bro. Maynard and I have been talking and dreaming for months about the possibility of planting a missional community, and the timing seems right, and the location also seems to be a diamond in the rough. Medicine Hat is a small city of just under 60,000 people about 3 hours southeast of Calgary. It has a surprisingly active arts community for a city its size - Medicine Hat Folk Club and the Medicine Hat JazzFest are two of their music festivals, and they also have a one-act play festival annually in June and a musical theatre each November. This was critical in our selection of locations, as was a good relationship with the local churches. So far, St. Barnabas Anglican has offered space if we need it, and we have been welcomed to become involved in the drama program at River Park Church (EMCC). Both understand our missional aims and that we are not intending to become part of their communities, but to plant a missional community of our own. We're still looking to connect with some of the other churches in the area before we launch. The community will be in a neo-monastic vein centered around a missional order. Since the cost of housing in Alberta is quite significant, we are initially looking for a large home that could house two or three families living communally in an older/established neighbourhood. It remains to be seen if we'll stick with that since it's such a big adjustment for all of us, but it's a good way for us to be able to focus all of our resources as we start out. Each of us will be working part-time and giving ourselves to missional endeavours the rest of the time. We are excited to be able to announce that we've found a couple of investors who will be funding our setup of a coffee house, which has some significant startup costs; their investment should cover the startup and first year until it becomes self-sustaining. St. Barnabas has offered space if we can't find anything right away, but we'll probably want to secure a lease someplace and get it going there rather than having to move it later. This is a big deal for us, because the investors understand what we're about and are putting up the money at very lenient terms... no interest for five years, and partly forgivable if it flops! I can't disclose who the investors are of course, but this is obviously pretty huge. At the moment we're hoping to find two more couples who would be able to pitch in with us at the outset, and are planning to be established there five months from today, on September 1st. After living in larger cities for so long, it's going to be a delight to settle into the slower pace of a small-ish city and make our homes there. If you are interested in exploring this adventure with us (hint, hint, Grace), feel free to email me or Brother Maynard. We'd love to dream with you!